As you know, a couple of weeks ago, we asked, “what are we going to do with the kale pesto” we made. 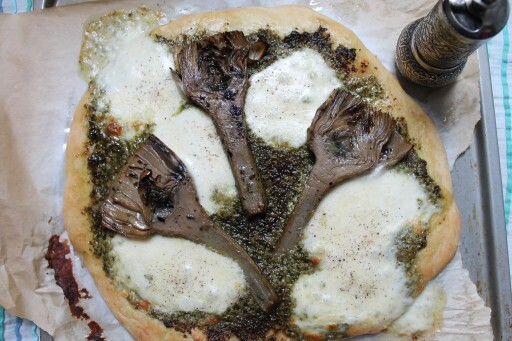 Here’s one super yummy solution – put it on pizza and add mozzarella ad artichokes! 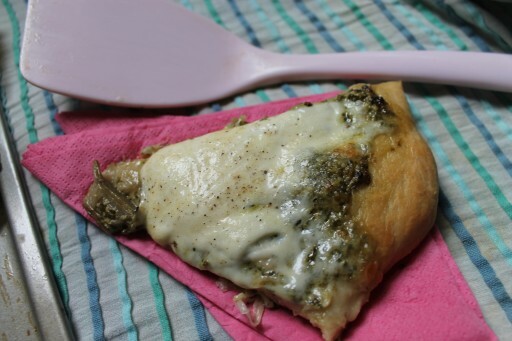 It was actually a perfect solution – an example of how the universe comes together in a way that allowed us to use our 1) freshly made pesto, 2) rapidly expiring mozzarella and 3) vacuum-packed grilled artichokes we’d earmarked for pizza and almost forgotten about. And the most important bit – we were able to put into practice Smitten Kitchen’s lazy pizza dough we had read a few months ago and somehow never had the chance to try out. Does this happen to you too? You read about some wonderful recipe, become incredibly motivated to use it and then somehow life gets in the way. Anyway, let us tell you – this pizza dough is so easy, so quick and incredibly satisfying when cooked. It’s much more of an American pizza – not quite a deep pan but much thicker than your Italian thin crust. Yum! Mix all the dough ingredients in a bowl with a spoon so that you achieve a round slightly sticky dough. On a floured surface, roll out the dough into a circular shape. It helps if you also flour your hands and the rolling pin. Transfer the dough to a baking sheet that is lined with greaseproof paper. We also oiled the paper just in case. 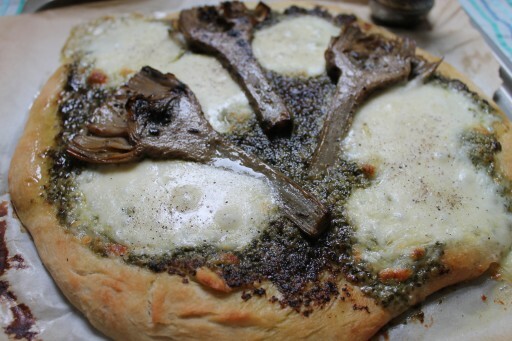 Top the dough with pesto, distributing it evenly. Add the slices of mozzarella and artichokes. Shake some pepper (using your super cool Turkish grinder) and drizzle olive oil over the pizza. Bake in the oven for 5 minutes, before turning down the oven to 200C and baking for a further 5 minutes until the pizza is golden brown. Take out of the oven and serve immediately. There you have it, super easy pizza!